QTY 12 Please select a quantity. 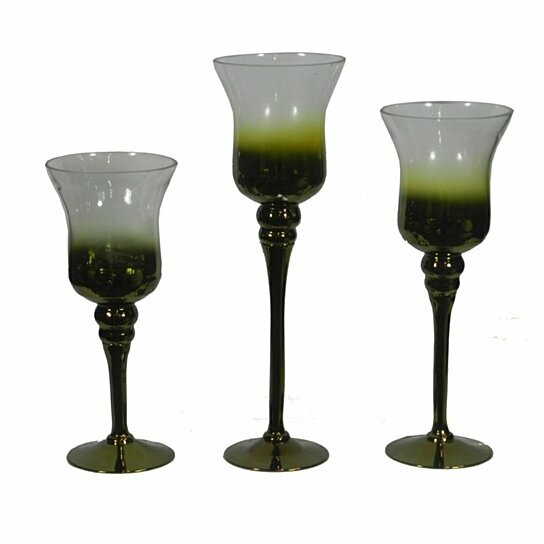 You just cannot ignore this set of three-glass candleholder. If you like decorating your house with candle holders, then you must check out this set. Shaped in goblet there are three candleholders in shades of green. These are traditional styled with amazing color combination. On any upcoming occasion, celebration, dinner get-together this set of candleholders will be worth including. It will add beauty to your home ambiance. This product can expose you to chemicals including Lead, which is known to the State of California to cause cancer or birth defects or other reproductive harm. For more information, go to www.P65Warnings.ca.gov. Adorn it in the drawing room, bedroom, kitchen or guests room.